This once a month topical cream will keep your scrappy little friend in good shape without the ugly necessity of force feeding him/her an unpalatable tablet. So if your dog is 8.8 lbs. or less, scientifically safeguard its quality of life as soon as possible using the patented Advantage Multi 3 Pack Small Dog formula. To clarify, this does or does not kill tapeworms? This product does't treat tapeworms. We recommend using NexGard or Drontal for tape worms. This product is licensed for use on dogs older than 7 weeks of age. Does this come in a 6 pack? Does advocate take care of ticks too? 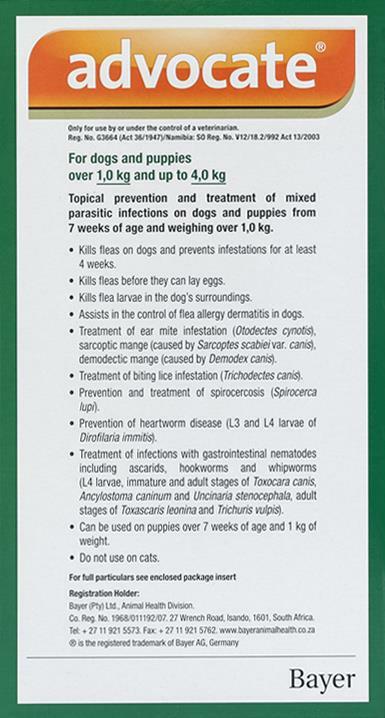 Hi Advantage Multi (advocate) prevents fleas, heartworm, gastrointestinal worms, mites and lice but not ticks. Both are exactly the same products. The manufacturer - Bayer - choose to market the product as Advocate in Europe and Advantage Multi in States. This product works great. I like that it is topical because Lucy is very picky about what you give her to eat, so this is easiest. Great PET BUCKET!! Thank you so Much for taking care of all "8" of my fur Babies Needs!! Arrived in 3 weeks, not bad! For the Great Prices!!! This product is Great! Easy to use and protects against many things.